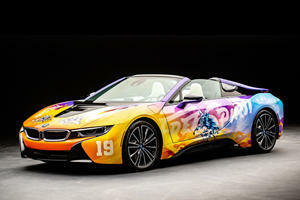 The updated BMW i8 is now available in an all-new Roadster body style. Power is provided by a turbocharged 1.5-liter 3-cylinder gas engine and electric motor offering a combined 374 hp that's sent to all four wheels through a 6-speed automatic transmission. The all-electric range is now 18 miles thanks to a larger battery pack and fuel economy is class-leading. Standard features include an 8.8-inch touchscreen with integrated navigation and smartphone compatibility. Paint and upholstery can be customized in a variety of colors and the available BMW Laserlight headlight system is new to the US market. When you look at an i8 drive past it is hard to believe that four years have gone by since it was first revealed. Those futuristic slashes and swoops have aged extremely well and BMW has been quite happy to carry out only the smallest of updates along the way. At the 2017 LA Auto Show we finally got to see a more comprehensive update as well as the reveal of the i8 Roadster. An had been shown before, way back in 2012 actually, but it was the coupe that ended up going into production first. That Spyder concept design and the final product are not very far removed stylistically speaking, which is a good thing. The suits the i8 well and the fabric roof section does not detract from its lines. Under the hood the Roadster will be receiving the incrementally enhanced electric motor that is now also fitted to the facelifted i8 Coupe. The 231-hp power output provided by the 1.5-liter turbocharged 3-cylinder gas engine remains as before but the electric motor produces a beefier 143 hp, up from 129 hp, and the battery capacity has grown from 7.1 kWh to 11.6. This is claimed to add a further 3 miles to the all-electric range taking it up to 18 miles. Weighing in at just over 132-lb more than the Coupe, the Roadster posts marginally slower acceleration times and slightly worse economy figures but both remain impressive. Unlike certain modern turbocharged M-cars that have lost their aural appeal, the i8 offers a rather pleasing off-beat three-cylinder growl from its small turbocharged gasoline motor. The combined electric/gasoline power output is now 374 hp, not quite supercar high but enough to get the 0-60 mph benchmark done in a claimed 4.4-seconds, (4.2 for the Coupe). Fuel economy is a claimed 60 mpge for both models. However results will vary depending on how much of that all-electric range can be taken advantage of on commutes. The complex drivetrain puts the power down to all four wheels (the electric motor powers the fronts and gas engine the rear wheels) through a 6-speed automatic transmission which is linked to the gasoline motor and a 2-speed automatic that transfers power from the electric motor. Complex yet seamless. Numerous detail changes such as lighter 20-inch alloy wheels and unique to the Roadster suspension and damper settings further add to the agility of this hybrid sportster. The battery pack can be fully recharged in approximately 3 hours and comes with an 8-year/100,000-mile warranty. The i8 Roadster pushes the boundaries of not only what is possible with current gas/electric hybrids but also how much customers are willing to pay for a car with a blue and white roundel on its hood. 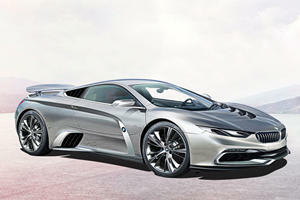 At a starting price of $163,300 it is the most expensive new BMW ever sold in the States. 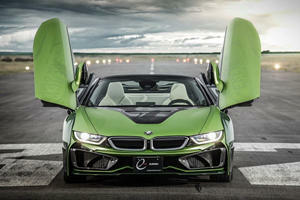 That is almost $16,000 more than the i8 Coupe and more than double the price of the similarly capable M4 Convertible. No one said saving the earth was going to be cheap. When looking at rivals you have a range of powerful gas-powered alternatives such as the Porsche 911, Jaguar F-Type and Chevrolet Corvette to pick from. When looked at strictly from a price/performance perspective the i8 does not fair particularly well. gets you a whole lot of Porsche 911 and two Corvettes Z06s. These cars offer a lot more power and straight-line speed but they should do, they are the last of a dying breed. The i8 looks more special and offers nuanced and delicate handling characteristics but that hybrid drivetrain and carbon-fiber body shell is expensive cutting-edge tech and somebody has to pay for it. A more direct competitor is arguably the hybrid-powered Acura NSX, which offers a 573-hp combined power output and a 0-60 mph time of 2.7 seconds. 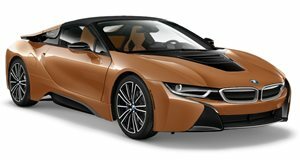 With a starting price of $157,800 it is the toughest challenge the i8 faces. It however is not available in a roadster body style and its 21 mpg combined consumption figure is more comparable to the gas-powered competition than the BMW. You also get a rather well-specced sportscar for your money too. A 12-speaker Harman Kardon sound system, keyless entry and start, configurable ambient lighting, 8.8-inch touch screen incorporating navigation and a 20GB audio storage system and a color head up display are all standard fitment. It doesn't have the latest autonomous driving aids and safety systems found in the current 7-Series and though, perhaps not a big deal breaker in a focused sports car. Features such as the hybrid-specific Dynamic Stability Control, dynamic damper control and carbon-fiber-reinforced plastic passenger cell may add more value in this segment. Optional equipment is basically limited to some exterior paint options, a few upholstery color combinations and a handful of alloy wheel designs. You can also add the BMW Laserlight headlight option, a $6,300 feature that is a first in the US market for BMW. Practicality is not a strong point in this segment and while there are a few cleverly placed storage places within the cabin the Roadster makes do without the small rear seats that are present in the Coupe. They may only be suitable for small children at the best of times but they do offer some welcome additional storage space. The fabric roof can be raised in 15-seconds and you do not have to be stationary to do it either, it will function at speeds of up to 31 mph. While the addition of the Roadster increases the i8’s appeal, as do the incremental powertrain improvements, the package as a whole remains a curious half-way house between a traditional sportscar and an eco-conscious window in to the future. Aside from direct price comparisons with less complex, and at times faster rivals, the i8 is a fascinating hybrid sportscar that combines two ideologies in one very desirable body shell. Massive wheel arches? Check. Carbon fiber spoiler? Oh yeah. But what about the i8 and new 8 Series?